UK GDP growth slowed sharply at the beginning of this year. Over the same period, Britons suffered through unseasonably cold weather, popularly known as “The Beast from the East”. Are the two related? One way to get at this question is to ask workers how much time they took off due to poor weather – if people worked less, this probably affected how much we produced! Luckily this is precisely what happens in the UK’s main labour market survey – the Labour Force Survey. Respondents are asked if they worked their normal working hours in the previous week and if not, why? Below I have charted the numbers of workers saying they worked fewer hours than usual due to weather conditions [note: this is weighted to be representative of the whole UK economy]. also shows spikes in previous periods of heavy snow – particularly Q1 and Q4 2010 (the former of which Wikipedia reliably informs me was known as ‘The Big Freeze’). 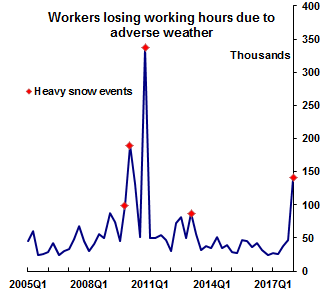 On average each individual who worked less than usual for weather related reasons worked about 2 days fewer. Adding this all up and throwing in the appropriate seasonal adjustment (some time is always lost to bad weather over winter), I estimate that total working hours were 0.15% lower than they otherwise would have been in Q1. What does this mean for GDP? Well mechanically, less hours worked are going to lower total output. Plugging this number into a standard Cobb-Douglas production function, this fall in labour input would generate a 0.1% drop in output. This is probably a lower bound, because the snow probably reduced productivity per hour worked as well. However this analysis is very much back of the envelope– so I would be cautious before assuming snow effects explain everything. Will Abel works in the Bank’s Structural Economic Analysis Division. Previous Post Fog in the Channel? How have equity markets reacted to Brexit news? Next Post Climate change and finance: what role for central banks and financial regulators?